So, some of my old Vanguard (VG) guild are back playing and I've fallen in love with the game all over again. When adding the game in Inner Space, choose Launchpad.exe as the executable. It will be in your main Vanguard directory. When running the quick setup wizard, choose Vanguard: Saga of Heroes. In your character set, make sure "Make game believe it is the foreground window" is checked. If not, you will get very low FPS on your slaves. You will need to log in to each account sequentially through Launchpad after you have launched your character set. Do not tick "Remember me on this computer" or the launchpad will keep trying to log you into the same account. I haven't worked out how to virtualise the necessary file to allow automatically logging in to different accounts. Otherwise, setup is pretty much the same as other SoE games. I tried using the Station Launcher but was unsuccessful. So what is VG like to multibox? /follow works over a long range but is a toggle, which takes some getting used to. This means if you hit follow and then hit it again your slave will stop following. However, combat does not break follow. Follow also requires you to target first. the game allows in-game macros but does not have a method of modifying bound keys for macros, so FTL is possible but is going to require a lot of hotbar slots. group size is 6 and the game is fairly resource hungry. I'm pretty sure I could 4 box on my rig but no so sure about 6.
the UI is only customisable in terms of graphics, layout and very minor functionality changes. Click healing, which relies on a consistent group ordering across group members, does not currently appear possible. Group member cast bars, targets, etc. would need to be created using Video FX rather than in-game features. when harvesting, all group members can assist, resulting in better chance of rares and higher yields. flying mounts are rentable for 5 minutes at various locations and also available as high level quest rewards but follow seems to be flaky when flying (it appears not to work in the z-axis). Anyway, I'm happy to answer questions for anyone interested. I can't believe you left us for V-A-N-G-U-A-R-D. I didn't leave you for vanguard. I just stopped playing MMOs for a while because RIFT was boring and I couldn't stomach any more WoW. Vanguard is a really solid game now - pity there is almost no one left playing it. Alge wrote: I didn't leave you for vanguard. I just stopped playing MMOs for a while because RIFT was boring and I couldn't stomach any more WoW. Vanguard is a really solid game now - pity there is almost no one left playing it. a brand new game and learning it when I'm holding out for other options in the near future. You still playing Vanguard Alge? I was really disappointed that it never made a comeback, definitely had amazing potential. I loved the blood mage class. I would like to try it out again, but don't think I am willing to pay for multiple toons. Yeah, I'm still playing Vanguard. I leveled a couple of trios to the mid 20s: a Dread Knight, Shaman and Necro; and a Paladin, Disciple and Bard. I'm now on a full group of 6 thanks to an R6990 and 16GB of RAM: Dread Knight, Shaman, Bard, Psionicist, Necromancer, Sorcerer. They recently hit level 30 and things are going well. I was able to do all of the good group content available in the 20s. I wouldn't be surprised if Vanguard goes free-to-play within the next 3 or so months. Also, there is a free trial for the first 10 levels if you just wanted to check things out (and you can subscribe straight from the trial without having to buy the game). Also any tips on setup for a duo would be greatly appreciated like macros and such. In game ones of course. My dk has some stuff in a dps macro but he still needs other keys for his aoe and harrow etc which i just won't pass to other char but any you could recommend for the dk would be great to as mine are not that great. Also again why the shaman over a dif healre class is what i would like to know as soon as possible as I want to get this team started bm is only lvl 11 so not to late to start over as shaman or even cleric but damn they do no dmg so kinda trying to stay away from it as wnat it to help dps as well as heal which is why the bm. sorry for repeating some things. EDIT: Also how did you end up handling things like cc etc that you might use targetlasttarget and such for? I chose shaman partly because I have a full group and so the low DPS is not so much of an issue and partly because of the nice buffs (incl. END regen) that bear SHM get to support my tank. Now that my group of 6 is level 34 my shaman does little apart from healing. When I do decide to do some melee with the shaman, all of its melee abilities are based of END so they do not use up precious mana which is needed for heals. In a duo or trio I would probably go with BMG or DSC, due to the better DPS. Although you should be aware that if you choose BMG you will be limited to fighting mobs that are not much more than +2 to your level or your resists will result in reduced healing just when you need it most. Additionally, with the BMG or DSC there is another resource to manage (blood pact or jin) which is easier to do when you only have to watch a few characters. I'll post some more details of my setup when I am at my normal machine later. Def appreciate you showing me more of your setup later on for sure can't wait. And yeah I guess melee healer might be better in a way and it won;t always be just duo i will be in groups with others a lot of times to help them etc when short of enough for group etc. Problem is the ones i group with there is only 2 of most nights and there mostly dps ie ranger and druid who can keep my dk lhealed pretty good up to a point but we haven't done any real dungeons yet the 3 of us as I think we need a real healer to go with us preferably one with better dps then cleric. Will decide more on my decision more later on once i see your next post etc. Above you can see my DPS macro and my rescue macro. Everything else is mostly single button. 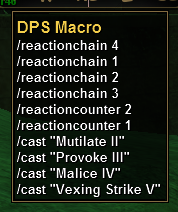 For assist and follow I just made some simple macros and placed them on my action bars and broadcast the appropriate key using a mapped key. Healing is a bit more complicated as I use click bars and a click healing system (but an explanation of that would take me a long time). Also, I completely redid most of my UI using CoreUI as a base (as you can see below). It has my character names hardcoded into it for the colour-coding. I also heavily use Video FX to see my other characters cast bars, defensive targets and some of their action bars.